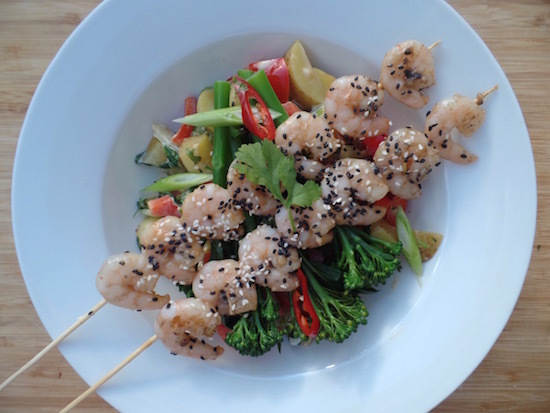 Emily's Recipes and Reviews | UK Food Blog | Leicestershire : sesame king prawn skewers with chinese style potato salad. 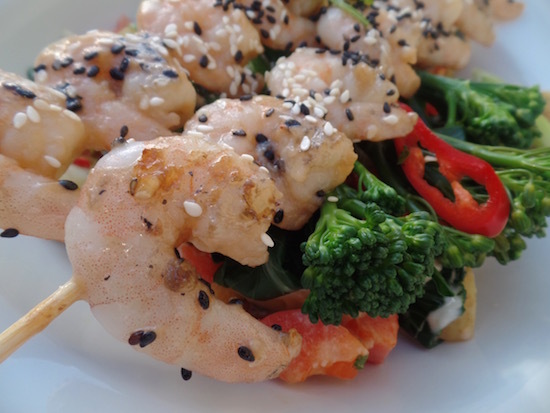 sesame king prawn skewers with chinese style potato salad. This is a simple Chinese inspired BBQ recipe which can be easily made ahead and cooked at the last minute. 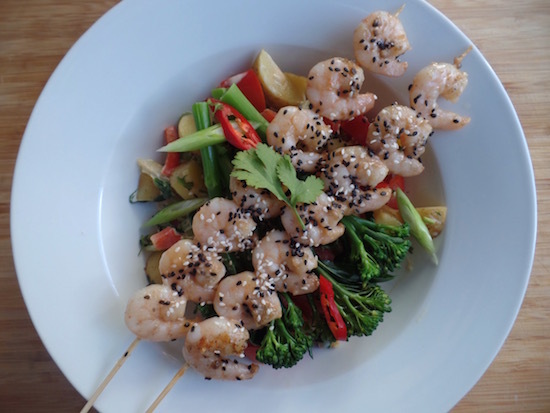 The Chinese style potato salad and oyster sauce marinated prawns are a great twist on a classic, which demonstrate the deliciously versatile sauces from Lee Kum Kee. Simply have your skewers ready and potato salad in the fridge - ready for your appetite! 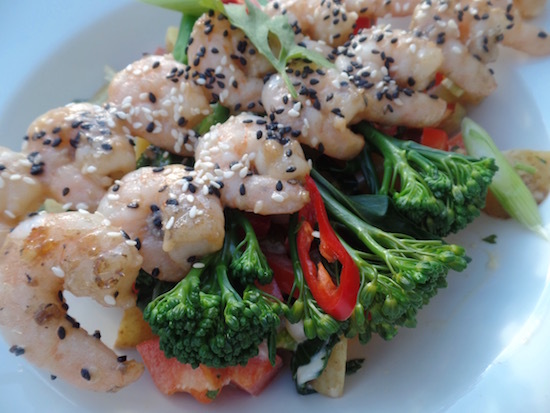 For those of you who aren't familiar, the LKK oriental sesame dressing is a blend of soy sauce, sesame oil, vinegar, garlic and chilli, making it perfect for adding a Chinese twist to your recipes. Step one. Soak the bamboo skewers in water for 30 minutes to soften. Step two. 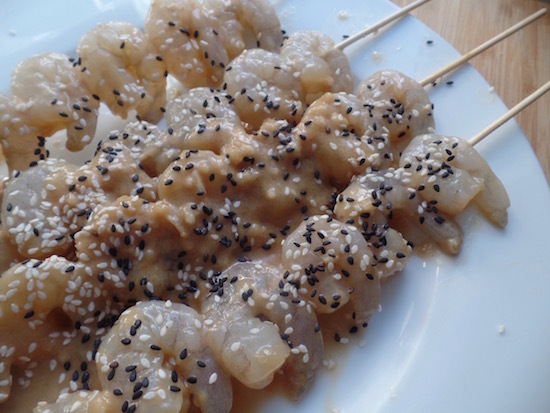 Marinade the king prawns, thread onto the skewers and scatter with sesame seeds. Step three. Boil the potatoes in a large saucepan in salted water. Step four. After 5 minutes, add in the broccoli and pak choi. Boil for a further 5-7 minutes. Step five. Meanwhile, slice up your third spring onion and the chilli at a diagonal. Step six. 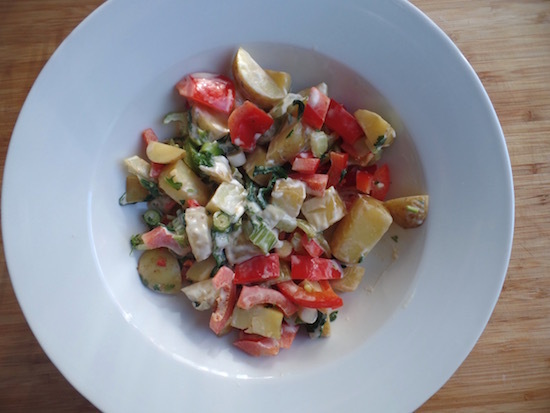 When the potatoes and veg are cooked, toss together with the red pepper and spring onions. Stir through the sesame dressing and mayo and scatter with the chilli and spring onion. Set aside or keep in the fridge for later. If you really can't find the dressing - stir through soy sauce with the mayo instead. When you're ready to go - fire up the BBQ! Step seven. Barbecue your skewers for 5 minutes, or a little longer until the prawn are completely pink and cooked through. Step eight. Serve the skewers on top of the potato salad. What barbecue recipes will you be trying out this year? 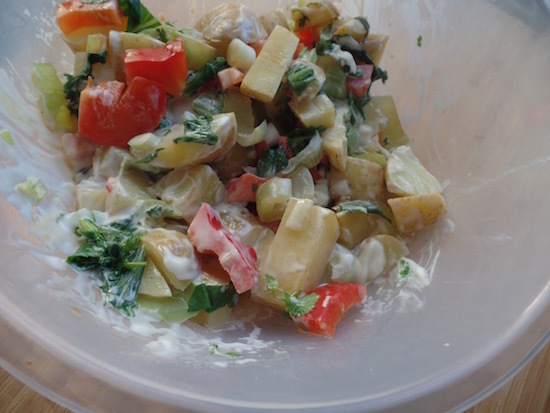 Have you ever made a twist on a classic potato salad? Note: Post in collaboration with Lee Kum Kee. All recipes, words and photographs are my own. They have some lovely stuff :) Thanks Camilla! 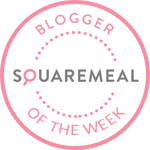 I really like the Lee Kum Kee Sesame Dressing, it taste good with any chicken and noodles you cook, I did just get a free bottle of it from http://www.freestuffbaby.co.uk/free-lee-kum-kee-sesame-dressing/ and I am definitely going to buy it once its all gone!